We don’t need more government. We need better government and more accountability: from the President through Barney Frank and the rest in congress and to Geither and all the other bureaucrats. Who among us thinks Barney Frank and Christopher Dodd screwed up? Who has trust and confidence that Barney and Chris and Tiny Tim Turbo Tax and even Obama can get us out of this? Yesterday it looks like Mr. Geithner actually fired — or at least sent into the penalty box — one of his top deputies. Now we are getting to the issue. Scott Polakoff at Treasury’s Office of Thrift Supervision is on ice: and Treasury needs to explain why and take responsibility for him and his actions and fast. Maybe we don’t need to make more rules: maybe we need to enforce the ones we have and enforce accountability. Recovery will be about trust and confidence. Without that, investors hold back, businesses don’t hire and workers don’t spend. A government mea culpa would be a good first step: and continuing this line of “we inherited” is now more than paper thin it is a sign of impotence. “What we need today is more optimism and more confidence,” Larry Summers said. “Consumer confidence is slightly up. The market is slightly up,” Biden said. “We need confidence to make this recovery work,” President Obama said. Confidence can’t be produced with fairy dust or a magic wand. We get it the old fashioned way: we earn it. President Obama has to take dramatic action: not giggle through an appearance on Leno and “60 Minutes” or jabber on an Internet town hall. That may work with tweens but it is not so good with real adults with real money. Campaigning is for wannabees. Those with real responsibility and accountability have to act to be credible and earn trust and confidence. Am I supposed to trust Turbo Tax Geithner? YIKES. Hillary, Rahm Emanuel, Robert Gibbs? 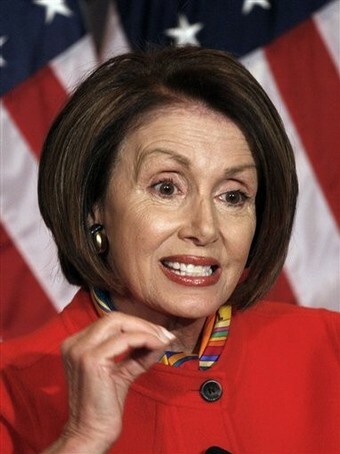 Am I supposed to trust the House of Representatives and Nancy Pelosi? Pelosi is telling illegal immigrats the law enforcers are anti-America. Has Dodd given back the AIG donations to his campaign — after he wanted AIG bonuses repaid? HA! A bit of hope from the Senate! In the Senate, the buck really has to stop now for conservatives…..
With the braying of 328 yahoos — members of the House of Representatives who voted for retroactive and punitive use of the tax code to confiscate the legal earnings of a small, unpopular group — still reverberating, the Obama administration yesterday invited private-sector investors to become business partners with the capricious and increasingly anti-constitutional government. This latest plan to unfreeze the financial system came almost half a year after Congress shoveled $700 billion into the Troubled Assets Relief Program, $325 billion of which has been spent without purchasing any toxic assets. Another embarrassing auditor of American misgovernment is China, whose premier has rightly noted the unsustainable trajectory of America’s high-consumption, low-savings economy. He has also decorously but clearly expressed sensible fears that his country’s $1 trillion-plus of dollar-denominated assets might be devalued by America choosing, as banana republics have done, to use inflation for partial repudiation of improvidently incurred debts. From Mexico, America is receiving needed instruction about fundamental rights and the rule of law. A leading Democrat trying to abolish the right of workers to secret ballots in unionization elections is California’s Rep. George Miller who, with 15 other Democrats, in 2001 admonished Mexico: “The secret ballot is absolutely necessary in order to ensure that workers are not intimidated into voting for a union they might not otherwise choose.” Last year, Mexico’s highest court unanimously affirmed for Mexicans the right that Democrats want to strip from Americans. Congress, with the approval of a president who has waxed censorious about his predecessor’s imperious unilateralism in dealing with other nations, has shredded the North American Free Trade Agreement. Congress used the omnibus spending bill to abolish a program that was created as part of a protracted U.S. stall regarding compliance with its obligation to allow Mexican long-haul trucks on U.S. roads. The program, testing the safety of Mexican trucking, became an embarrassment because it found Mexican trucking at least as safe as U.S. trucking. Mexico has resorted to protectionism — tariffs on many U.S. goods — in retaliation for Democrats’ protection of the Teamsters union. NAFTA, like all treaties, is the “supreme law of the land.” So says the Constitution. It is, however, a cobweb constraint on a Congress that, ignoring the document’s unambiguous stipulations that the House shall be composed of members chosen “by the people of the several states,” is voting to pretend that the District of Columbia is a state. Hence it supposedly can have a Democratic member of the House and, down the descending road, two Democratic senators. Congress rationalizes this anti-constitutional willfulness by citing the Constitution’s language that each house shall be the judge of the “qualifications” of its members and that Congress can “exercise exclusive legislation” over the District. What, then, prevents Congress from giving House and Senate seats to Yellowstone National Park, over which Congress exercises exclusive legislation? Only Congress’s capacity for embarrassment. So, not much. The Federal Reserve, by long practice rather than law, has been insulated from politics in performing its fundamental function of preserving the currency as a store of value — preventing inflation. Now, however, by undertaking hitherto uncontemplated functions, it has become an appendage of the executive branch. The coming costs, in political manipulation of the money supply, of this forfeiture of independence could be steep. Jefferson warned that “great innovations should not be forced on slender majorities.” But Democrats, who trace their party’s pedigree to Jefferson, are contemplating using “reconciliation” — a legislative maneuver abused by both parties to severely truncate debate and limit the minority’s right to resist — to impose vast and controversial changes on the 17 percent of the economy that is health care. When the Congressional Budget Office announced that the president’s budget underestimates by $2.3 trillion the likely deficits over the next decade, his budget director, Peter Orszag, said: All long-range budget forecasts are notoriously unreliable — so rely on ours. This is but a partial list of recent lawlessness, situational constitutionalism and institutional derangement. Such political malfeasance is pertinent to the financial meltdown as the administration, desperately seeking confidence, tries to stabilize the economy by vastly enlarging government’s role in it. That from Joe Nocera in The New York Times. I agree with Joe 100% but he is a lot smarter than me! Yes, the $165 million in bonuses handed out to executives in the financial products division of American International Group was infuriating. Truly, it was. As many others have noted, this is the same unit whose shenanigans came perilously close to bringing the world’s financial system to its knees. When the Federal Reserve chairman, Ben Bernanke, said recently that A.I.G.’s “irresponsible bets” had made him “more angry” than anything else about the financial crisis, he could have been speaking for most Americans. Or how about those efforts to publicize names of individual executives who received bonuses — efforts championed by Attorney General Andrew Cuomo of New York and Barney Frank, chairman of the House Financial Services Committee. To what end? Then there was that awful Congressional hearing on Wednesday, in which A.I.G.’s newly installed chief executive, Edward Liddy, was forced to listen to one outraged member of Congress after another rail about bonuses — and obsess about when Treasury Secretary Timothy Geithner learned about them — while ignoring far more troubling problems surrounding the A.I.G. rescue. Oh, and let’s not forget the bill that was passed on Thursday by the House of Representatives. It would tax at a 90 percent rate bonus payments made to anyone who earned over $250,000 at any financial institution receiving significant bailout funds. Should it become law, it will affect tens of thousands of employees who had absolutely nothing to do with creating the crisis, and who are trying to help fix their companies. I believe all that. I also know that the president, his team, Tim Geithner, Larry Summers, Joe Biden, Chris Dodd, Harry Reid, Nancy Pelosi, Barney Frank and a host of others are frittering away the confidence Americans and many others in the world like China need to make the recovery work…. “The whole congress should have their income taxed at 90% because of their incompetence,” said former Arkansas Governor Mike Huchabee today on Fox. You can’t urge confidence while spending trillions of taxpayers dollars and then spend, waste, an entire legislative week on $167 million with nothing to show for the effort except for a loss of confidence. Congress this last week sent a torpedo into confidence in banks, companies like AIG, the Treasury, the White House, truth, honesty and themselves. The pain of your living, moronic behavior in a time of crisis is killing me and it should be killing you. The wrong guy is going to die if the economy worsens: the taxpayer. After the mass Seppuku (切腹 ) on Capitol Hill, the president can fire Geithner in an attempt to bring back some confidence. Some iota of confidence. At least firing Geithner will be a pro-active step. But nobody seems ready to do the right thing; even though I did the right thing by sending in my professionally (no Turbo Tax for me) prepared IRS forms yesterday…. And are we expected to have confidence in the president’s budget and allow rapacious spending on health care, energy, climate change and education? Not after yesterday’s CBO report and not after what we”ve seen since Barack Obama and this congress go into the act…. Please see all the goodies at Michelle Malkin’s house…. President Obama, Joe Biden, Tim Geithner, Larry Summers, Chris Dodd, Harry Reid, Nancy Pelosi, Barney Frank and a host of others are running off to spend our money too fast and we have lost confidence…..
That’s from my friend who lost his job, will lose his home to foreclosure and has gained only a credit score that would bring Tiger Woods to tears. He used “eating my lunch” instead of “breaking my heart” because he’s purchased a gun and a broken heart was getting him nowhere. He’s getting kind of heartless. “Eating someone else’s lunch is un-American, as Nancy Pelosi must know,” he told me. He has a lot of time to watch TV now that he lost his income and his job. For those in the immigrant community that only habla Espanol, when the law is enforced at your door, that is the law, which most people, except for Nancy Pelosi, do not consider as un-American. When someone eats your lunch, which is an idiom, it means to take advantage of you, as in “clean your clock,” cross the border illegally and stuff like that. The President is eating my lunch beause he refuses to fire Tim Geithner — but now maybe he will rethink that after finding out that Turbo Tax Tim had many of the bailout recipients sign a form indicating, maybe even swearing, that they did not owe the federal government any back taxes — but Tim never asked the IRS to check. Those that got billions in bailout money ate Turbo Tax Tim’s lunch and the lunch and tax money of every taxpayer. My friend is working hard trying to get a real job: not a cushy do anything and get paid job. Not a job with no accountability like Geithner’s job. Not a job where you can lie like Dodd’s job. Not a job where you can write a book and make $5 million, or get on Jay Leno, or fly in style like Obama’s job. Bernanke is eating my lunch because his Fed action already caused the price of oil to go up and the value of the dollar to go down. Every American lawmaker in Washington DC who did not vote against the stimulus ate my lunch because nobody read the stimulus and that is the law that allowed AIG to pay bonuses — while it gave away billions of dollars. That’s not lunch money. But maybe chump change to Obama: not to me. I pay my taxes — and not with Turbo Tax — I hire a guy because that ensures it gets done better than Geithner can do. And those “lawmakers” who gave billions of dollars to the likes of Obama, Geithner and Bernanke and a bunch of government agents who are eating my lunch and getting their clocks cleaned by those getting bailout money — I hate them all. The entire lunch eating flock. He ate our lunch for sure. I’ll just throw Charlie Rangel in here for eating my lunch too. He’s trying to rush a 90% tax on those that got bonuses like the AIG guys. But hey, Charlie: that might be unconstitutional. And hey, Chalie, can you go though an audit for us, pal? Amnesia Chris Dodd ate our lunch and then lied about it: putting language into the stimulus to help his buddies at AIG to pay those now famous bonuses. Then Judas Dodd threw his buddies at AIG under the bus. Barack Obama hired Turbo Tax Tim and Joe Biden so he continues to eat my lunch every day. But the president wants ME, US, and YOU to be confident because that could help the economy improve. Lawmaking by Stampede Made the Stimulus, Now We’ll Tax ‘Bonuses’ the Simulus Allowed? AIG Bonus Snafu: Boomeranging Into the Faces of Democrats? News at eleven followed by Jay Leno and Barack on the National Barack Channel…. Just like FEMA Director Michael D. Brown had to be fired after Katrina, just after the President of the Uited States said, “Brownie, you’re doing a heck of a job,” Treasury Secretary Tim Geithner also has to be fired. He was head of the New York Federal Reserve when AIG got into real trouble and needed a federal bailout. He apparently has amnesia or slept through meetings where the AIG bonus money was discussed and allowed. And as Tresury Secretary his performance has been lackluster. He did know about the stimulus bonus exceptions early on and did nothing to stop them — which allowed AIG to pay the stimuluses in good faith, allowed a preventable presidential “outrage” moment and a congressional lynching on TV of AIG’s top man: who took the job last year when Treasury asked him and only accepts $1 a year in pay. Geithner is the one man most responsible for voter lack of confidence in this economy. And as the president has been saying: without confidence the economy may last a lot longer. Presidents have been wrong before. The good presidents admit it. Time for a Mayflower Move for Turbo Tax Tim, Mister President…. My confidence is shot, Mister President. When reporters start asking “What did he know and when did he know it?” about a presidential appointee: the drimbeat has started. The simple answer to the question, “When did Geithner know about the AIG bonuses?” is: last year. “How the Obama administration was caught flat-footed by this controversy dates back to last Fall, when the New York Federal Reserve Bank — then run by Geithner — stepped in to give AIG a high-interest loan for $85 billion to help prevent the company from going under — which Lehman Brothers was doing at the time. As part of the deal, AIG CEO Robert Willumstad was replaced by the new CEO, Liddy,” wrote Jake Tapper of ABC News. If Geithner didn’t know that his organization didn’t put any limits on AIG bonuses last year and he just shoveled them money without strings: shame on him. And shame on Obama. And shame on the Senate that confirmed Turbo Tax Tim. 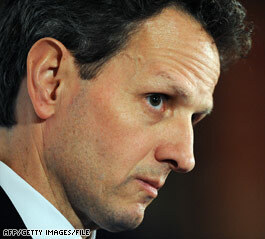 What few have said about Geithner is easy to see: he would be a handy blame guy for Obama and his Administration. The AIG mess is not as much about corporate greed as the Administration and the liberal media want people to believe. It is also about the ineptitude of government. Turning around the belief that the top Obama people don’t know what they are doing could be resolved at least somewhat by sacking Geithner…. This is now about credibility, confidence, and competance. Without those things; investors won’t flood back into the markets, house buying will be depressed and the overal economic stimulus of buyers buying will not reboud as all of us would like. The president himself has told us that confidence is the key to recovery. And leaders like Warren Buffett have urged the president to take dramatic action — like making the economy the number one priority as if we were in a war…. Well the presidnet is in a war now: a war of credibility, confidence, and competance. And since Obama has repeatedly said he has no intention of backing away from his agressive spending ways and wants to move his agenda ahead with gusto (saying just yesterday, “I didn’t come here to pass on our problems to the next president or the next generation. I came here to solve them. 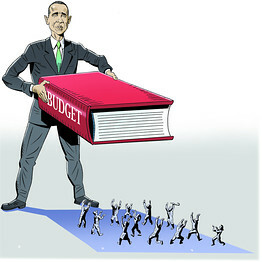 “): Geithern and the AIG mess stands in the way of the president’s spending agenda and the speed he needs to execute that. So executing Geithner makes a lot of sense. It makes the only sense. Making AIG repay millions after thy got billions may be dramatic to some. But making the key responsible government representative accounable by firing him would be a necessary step in regaining the president’s own reputation for credibility, confidence, and competance. If not distancing itself from Treasury Secretary Timothy Geithner, the White House is placing firmly on his shoulders responsibility for how the government handled the $165 million in bonuses paid to about 400 executives and traders at American International Group Inc.
“Secretary Geithner last week engaged with the CEO of AIG to communicate what we thought were outrageous and unacceptable bonuses,” White House spokesman Robert Gibbs said Tuesday. Then he volunteered the answer to a question being asked all over Washington: Did Geithner still enjoy President Barack Obama‘s confidence, given the whopping bonuses the failed insurance giant paid Friday after receiving taxpayer bailout money? “The president has complete confidence” in Geithner, Gibbs said. Is Obama satisfied that Geithner informed him of the impending bonus payments in a timely fashion? “Yes, the president is satisfied,” Gibbs replied. Those, of course, are statements that wouldn’t need to be made if Geithner’s status were clear. Not just a president’s confidence, but his “complete confidence” can be a well-worn political signal that the subject should start circulating a resume. President Barack Obama has “complete confidence” in Treasury Secretary Timothy Geithner, and any suggestion he bungled over the AIG bonuses storm is “unfair” the White House said Tuesday. That according to AFP.A twenty eight word article. My years in government tell me this: Geithner: pack your desk. Democratic Senator Chuck Schumer wants the AIG bonus money back. We have been told that “a big hunk” of the bonus money was paid by AIG to people that are not Americans and not subject to U.S. tax law…. The top Republican on the Senate Banking Committee is questioning whether Treasury Secretary Timothy Geithner responded appropriately to American Insurance Group’s payment of millions in executive bonuses. On the most important issue of the day, the NEWSWEEK Poll shows that close to two thirds (65 percent) of the public say they are very or somewhat confident that Obama will be successful in turning the economy around. That’s down just a little from the 71 percent who felt that way before he took office. Still, overall perceptions of the economy remain solidly negative, with 84 percent saying the national economy is in poor shape and just 3 percent viewing things positively.